Easy and delicious Pineapple Casserole. 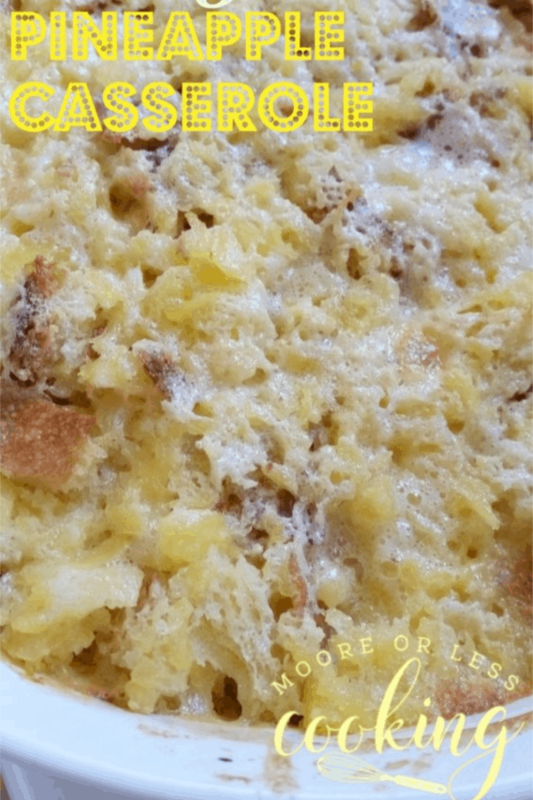 5 ingredients are all you need to make this wonderful light and fluffy pineapple baked casserole! I wanted to make an easy side dish to go along with our Easter Supper. I love pineapple recipes and thought this would be perfect served along with my Slow Cooker Shredded Beef Roast. I was right! My kids asked what is in this as they were serving themselves. I said taste it and let me know! I heard lots of mmmm’s and Yum’s, this is so delicious Mom! Can you make it again? Pineapple is such a wonderful fruit for this dish. It isn’t overly sweet. So it’s so nice served with ham or a roast as a side dish. Kids love it. 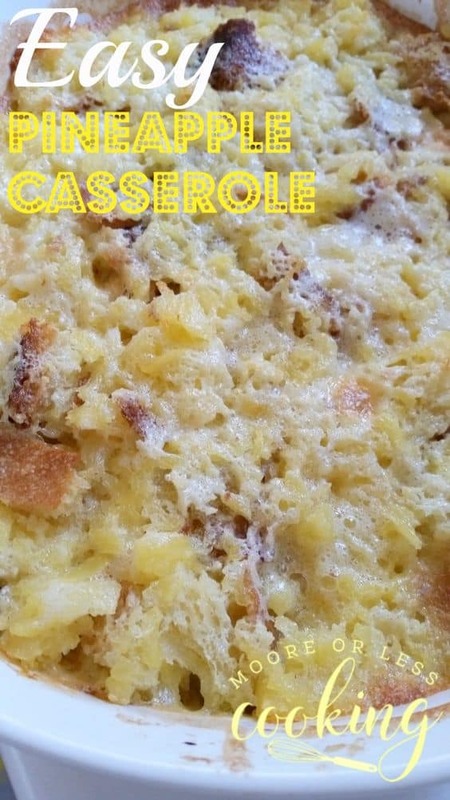 Easy Pineapple Casserole~ Only 5 ingredients needed to make this light and fluffy side dish, perfect served with ham, pork roast or beef roast. Butter a 1 1/2-quart casserole dish. Combine the undrained pineapple with salt, sugar, and flour. Stir in the beaten eggs. Toss bread cubes with the melted butter; fold into the pineapple mixture. Pour the pineapple mixture into the prepared casserole dish and bake in the preheated 350 F for 40 to 50 minutes, or until set. I love this recipe. Looks delicious and I think it would be great served with ham too. Yummy! I really loving this recipe! I can just imagine it with a fresh baked ham! what is the best bread for this recipe? I used a dense french loaf bread ( baguette). Thank so much for the quick response…it has been requested that I bring this for a side on Christmas day and your recipe looks the best. Do I just kind of wing it on how much bread to use since it was calling for slices? I’ve never made this dish before. Love this! I know what will be sitting next to my ham this Easter. Yes, that is the right amount for the bread. I’ve gotten a similar recipe from my aunt and it has about a cup of shredded cheddar cheese mixed in as the last ingredient. I also sprinkle some on top. It sounds weird with pineapple but oh so good! I also mix mine up the night before so everything gets a good soak and then prepare it in my crockpot while I’m at church! That’s a great idea making it in a crockpot! I, too, am curious about the amount of bread as “slices” are so variable. Could you please give me a weight or approximate volume in cups so I get the correct ratio? Thank you so much. I used 4 cups of cubed bread. Hi! I don’t know if my last message posted. It looks like your recipe isn’t listed anymore. Can you let me know the recipe please? thank you! THANK YOU! I made this last Thanksgiving but didn’t write anything down. It is delicous!! You are welcome Michelle! Happy Thanksgiving!